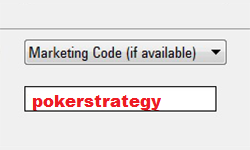 4 Choose "Marketing Code" in the Drop Down "How did you hear about PokerStars" and enter "pokerstrategy"
5 A pop up appears. Activate the checkbox in order to be able to collect StrategyPoints. You must login or register in order to enter an account. When you sign up with our marketing code 'pokerstrategy', PokerStars.ee welcomes you with $30 in free poker money if you deposit at least $20 using the bonus code 'THIRTY'. What about the classic deposit bonus? If you take part in this promotion you will not be eligible for the classic 100% up to $600 first deposit bonus at PokerStars.ee and vice versa. It's up to you which offer you choose. If you decide on the classic first deposit bonus please use the bonus code 'EE100' when making your first deposit. 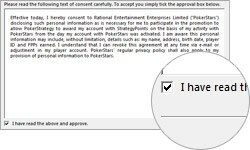 For questions or more details about the PokerStars.ee bonus, check out the PokerStars first deposit bonus conditions on our PokerStars forum.